It only seems like yesterday I was moving Evelyn from her tiny crib into a cot yet now its time for her to move from her cot to a "big bed". If I am totally honest its a move I have would have happily put off for as long as I could as I remember the constant struggle of trying to get James to stay in his bed, I was sure I was going to face again with Evelyn. However she has started to attempt to escape the cot and as she is quite tall I fear once she works out how to get over she will be straight out the cot and could really hurt herself. 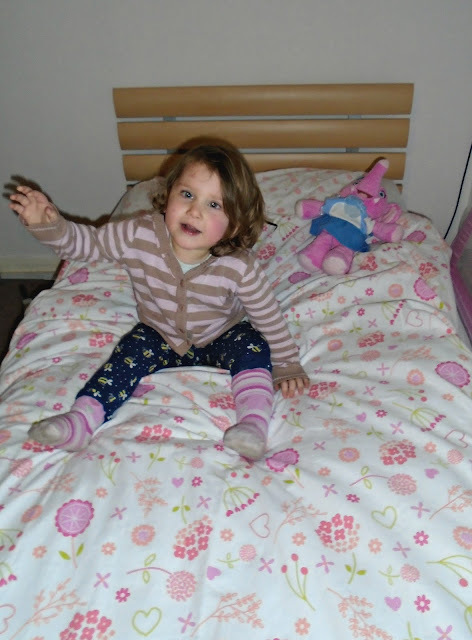 We were recently contacted by The Gro Company who offered us a Gro-To-Bed set to review and as we were just thinking of moving Evelyn in to a single bed this seemed like the perfect opportunity and we couldn't wait to try it out. The bedding is easy to fit on the bed with the base sheet being fitted around the mattress, it also has a large strap which runs around the bottom of the mattress which holds it in place even if your little one likes to wriggle at night! 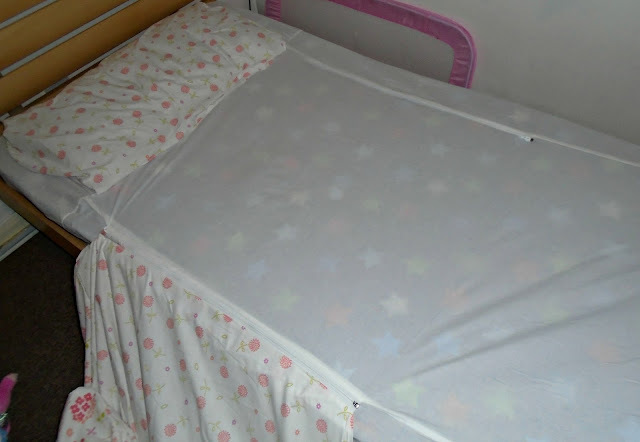 The pillow case is attached to the fitted sheet and you simply slide your child's normal pillow inside the pillow case. I loved this idea as it meant the pillow didn't slip of the bed and stayed securely in place all night. I would have liked it if the pillow case was removable like the duvet cover (read below) just for ease of washing, sometimes Evelyn spills milk or dribbles on her pillowcase and with the bedding design it would mean changing the whole sheet and pillowcase as its all attached. However the pro's of the pillow not slipping definitely outweigh this for us. The bedding set also includes a single size duvet cover too which can be used with any standard size single duvet. You just pop the duvet inside the cover as you would do any other duvet cover, however this one has the added extra of zips! Once you have placed your duvet inside you will find 2 zips, one side of the zips runs along the base sheet the other on the duvet cover. 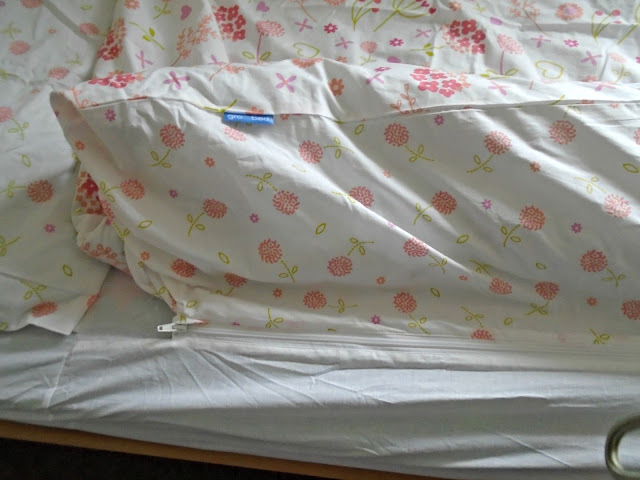 You simply zip these up and when your child snuggles down in to the duvet they can no long roll out the sides of the bed as the zips create almost a tube inside the bed that keeps your child secure. It also means the duvet can't roll off the bed or become twisted and tangled around your child. Evelyn is a complete wriggler in bed and you will never find her laying the same way you placed her in fact she constantly moves throughout the night, it was one of our main worries about putting her in a single bed. 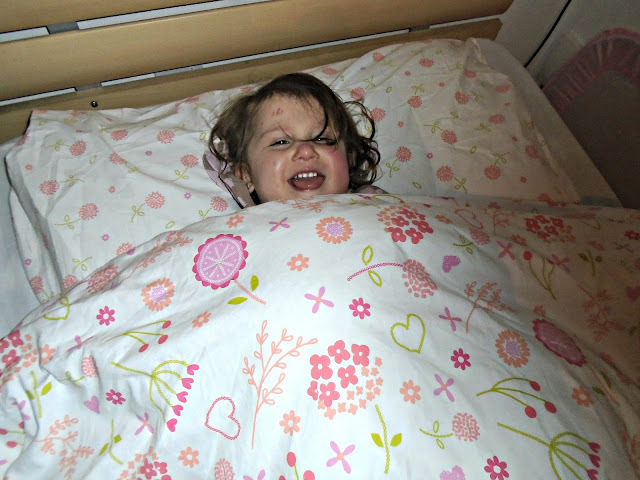 This is why we were so excited when we heard about the Gro-To-Bed bedding! Overall we loved the Gro-To-Bed set, the designs available are very cute and they really do work. The sets are easy to use and place on the bed and super soft against babies skin. Evelyn's pillow and duvet have stayed in place every night and we have all slept a little sounder knowing she is safer now that she can't really roll out. The Gro-To-Bed set is priced at £49.99 for a cot bed size or £59.99 for a single bed size. I know at first glace the price does seem steep but I since trying it I can honestly say it is worth every £! Firstly for that price you are getting a whole bed set including pillow case, base sheet and duvet cover (although the set does not include the actual pillow or duvet). Each item is 100% premium cotton so fantastic quality too.